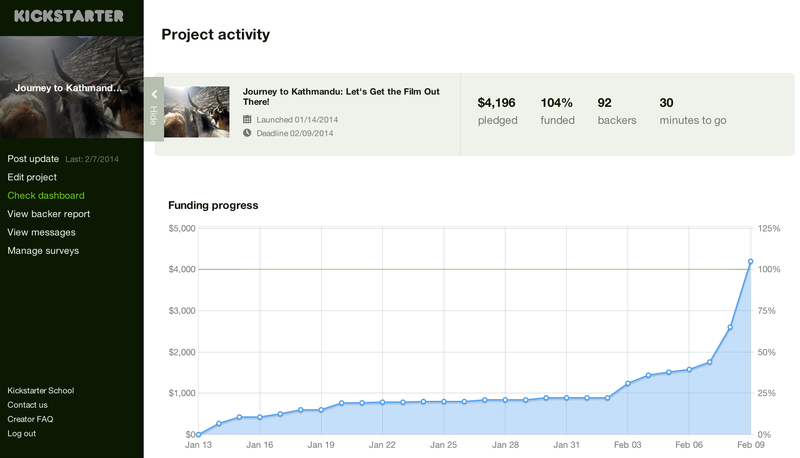 As most of you may already know, as of about 4 p.m. PST today, the ‘Journey to Kathmandu’ Kickstarter was funded! This is truly amazing considering that as of that same time yesterday we were only 43 percent funded. To say that you all picked up the proverbial torch on this one would be a vast understatement. Watching yesterday’s and today’s activity on both the Facebook and the Kickstarter pages was absolutely thrilling, inspiring, and well, just plain fun. This says three rather obvious things to me: (1) I have some amazing friends and family (2) you have some equally amazing friends and family (3) people like emails and photos of goats. I cannot thank you enough for all that you have done to keep this project going. You have collectively allowed me to get my film out to the world, which is what I’ve always wanted with this thing. Ah. The ‘Journey’ just continues. What’s next? Well, the ‘Journey to Kathmandu’ DVD/CD and the rest of the rewards. It will most likely take about a month or so to get the designs in and the duplication process underway, but after that happens I’ll be contacting each of you for your mailing addresses. Thanks again for all of this. Please check in with us from time to time by going to both the Facebook page as well aswww.JourneyToKathmandu.com ! « Half Way to Our Goat.. er, Goal!